NEWSFLASH……’The UK is hotter than the Costa Brava’…. ‘Heatwave hits the UK’ ….’Hottest Summer in 5 years’. These aren’t new headlines, in fact I guarantee that they will appear in a newspaper or heading an online article at some point this year. So when these headlines hit, its only natural to start to worry about our four legged family members health and wellbeing. What we tend to do in these situations is use our instinct. When we are hot, we take a layer of clothing off so its understandable that we feel we should take our dogs coats shorter in hot and sunny times. The problem is that not all dogs should be cut short. Fur bearing dogs are at risk from PCA (Post Clipping Alopecia also known as Coat Funk). The Most affected breeds are the fur bearers. Examples of fur bearing dogs are Chow Chows, Pomeranians, German Shepherds, Huskies and Golden Retrievers. These dogs have fur and not hair. They grow to a genetically pre determined length and then stop. They have a thick undercoat that needs to be brushed out regularly and they tend to drop their undercoat when it starts to get warm and when the heating goes on in our homes. If we cut in to this coat, it confuses the body's schedule and can result in Bald Spots and colour changes. Post Clipping Alopecia. The Correct grooming method for these dogs would be regular baths and brush outs to release the undercoat and allow the skin to breathe. Every 4-6 weeks. In truth, your fur bearing dog will be cooler with a full coat as long as it is properly maintained by your Spotlight Groomer. Dogs don’t sweat like humans, they only perspire through their paws and nose. Temperature regulation is done through their breathing. They pant to cool down and to regulate their temperature. This is why long nosed dogs have a much more effective natural cooling system than Brachycephalic (short skulled) dogs. Pugs and Bulldogs have a much harder time in the summer with heat stoke than German Shepherds and other long nosed breeds with a full coat simply because their cooling system is no where near as effective and yet they have a short coat. This again is why its essential that our fur bearers are regularly groomed and brushed out to regulate their body temperature effectively. If I suspect my dog of having PCA, can I get the coat back?? Great question….the answer is ‘yes’ (with luck and regular grooming). Once PCA is established it is very tricky to regenerate. It can be done but it takes a lot of patience and time. 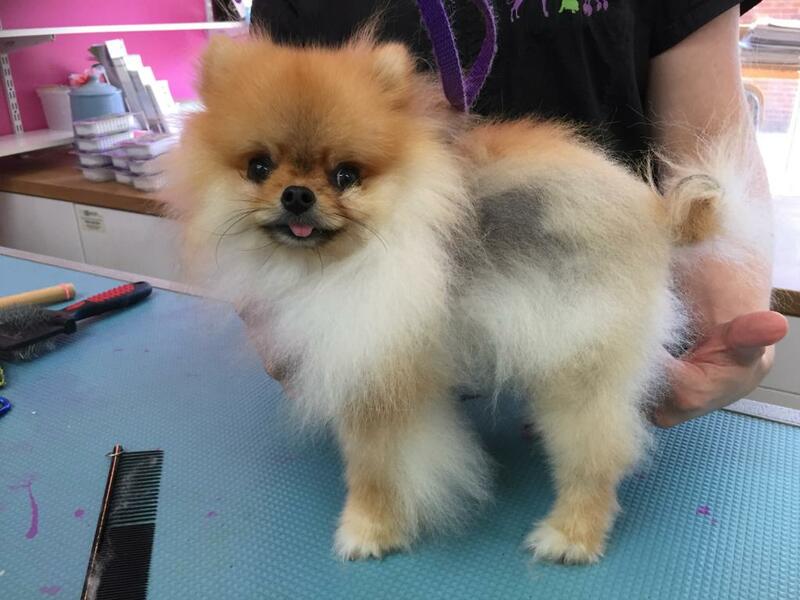 Sinbad the Pom in the picture above has a bad case of PCA but with regular grooming and follicle stimulation he is now back to a full coat. It has taken over a year to get it looking full again and that is quite a short amount of time for PCA affected dogs. Some never come back as full as it was originally. The moral of this tale is…Don’t shave your fur bearer. If you are worried about Heat Stroke and want to know the signs and symptoms, why not have a chat with your vet. They should be able to give tips and advice.